How often are we at Down Under Visa asked this question? It would have to be several times a week. And of course it’s an important issue. You will both be hoping that this is a once in a lifetime occasion, so of course you want it to be special. But there are also practical considerations, as the days of taking 4 weeks annual holidays in one go is ancient history for most of us. And time is the main issue! 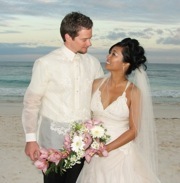 It takes generally 3 – 4 weeks to organise a wedding, which means you need to be in Philippines for 3 – 4 weeks. Weddings in the Philippines can be great fun. They are generally done in the Church. There are no “marriage celebrants”. Your choices are: Church, Judge, or Ships Captain. Unless you can get a Judge to marry you in a reception place somewhere, it means marrying in the courthouse. You and wedding party sit at the back of the courtroom and wait for him to finish sentencing someone and for him to say “Next!” A bit odd! Stick to the Church. NOTE: Despite what I said about who may be a marriage celebrant in the Philippines, we also see our clients being married by a mayor. They end up with legal marriage certificates, so it appears to be legal. And understand that the relatives will take over organising everything. Don’t expect much input. There will be wedding dresses, bridesmaid dresses, barong tagalog (funny-looking shirt) and black trousers for you and groomsmen. These all need to be made. There will be a marriage license to organise (10 days notice), a No Impediment to Marriage certificate from the Australian Embassy in Manila, arranging the priest and the Church, organising the catering, etc. You will also have a Government seminar to attend on birth control (all in Tagalog!) and other matters, and the Church will have either one or a series of pre cana seminars to attend too. However, on the day you will have probably hundreds of relatives in attendance. Lots of kids. Lots of grannies. Lots of chatter. And afterwards you will literally feed half the town. Yet this is not as expensive as it sounds if you let the relatives organise it. It will be a day to remember. And it will mean a lot to your wife and her family! However if you do not have the time to spare, and if you are not comfortable with crowds and noise and not having a clue what’s going on, then don’t! And if you’ve never been to the Philippines before and/or have not met in person before, then definitely don’t! You need time to deal with culture shock and you definitely need to spend time getting comfortable with each other! Don’t go through this and a wedding at the same time. If you can’t spare the time, and if you don’t think you could cope with a third-world wedding, then get us to organise a Prospective Marriage Visa (aka Fiancee Visa) for her and you can marry her in Australia. You’ll be on home turf, and you’ll have 9 months to organise it in. Come and see what we do at Down Under Visa by visiting our website! Hope we can help you. Tourist Visa when you wish to marry? We have just got our license to marry but apart from the NZ cenomar I also had to get a Filipino one as well..